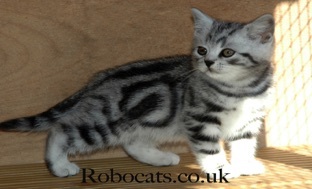 The best British Shorthair Silver Tabby cats in the world..
..breed the best Silver Tabby kittens in the world! Make no mistake - YOU AIN'T SEEN NOTHING YET.. Bold black stripes, oyster ovals and butterfly wings set on a silver background. Combined with distinctive head & facial markings, banded tail and spotted toes. Together they create a most elaborate pattern which sets them apart from other less spectacular cats. Absolutely the best choice for a family pet is a British Shorthair. Loving, gentle and extraordinarily trusting. Both silver tabby and silver spotted kittens have gorgeous temperaments. They love to be involved in family life and quickly find the most comfortable lap on which to fall asleep. These British cats often live for fifteen to twenty years - and more. 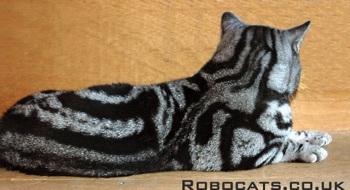 Here at Robocats we've just supplied another kitten to the third generation of the same family - so now Grandma, mum and daughter all have silver tabby and silver spotted cats from us. "Quite simply, it has to be the best - or nothing!"